It’s a movie about Chinese-Americans which means, yes, the main cast is caked in yellow face. It also deals with a generation and cultural gap. This includes a special mention of the fact that American women like showing off their legs, a habit the Americanized-Chinese descendents have picked up on. There are certain undertones in the relationship between Robinson’s Wong Low Get and Young’s Sun Toya San that don’t exactly sit right. More on that in a bit. There’s also a few moments that delve into how white people misuse immigrants and are insensitive shitheads, which would probably be more noteworthy if it weren’t for all the yellow face. An extramarital affair figures heavily into the plot. Our villain smokes quite a bit of opium. So much so that he sells his girlfriend into slavery to cover his bill! A couple of people get murdered, violently. The final kill in the movie is particularly gruesome. Oh, and our hero gets away with all of his various murders. Huzzah! The Hatchet Man is the dramatic story of three generations of Chinese immigrants and how their culture effectively almost ends their lives. We begin in San Francisco’s Chinatown in 1917. One Tong–a Chinese gang– is mourning the loss of a comrade. They call upon their hatchet man, Wong Low Get, to assassinate the killer; he finds to his dismay, however, that the man who he’s been assigned to kill is his best friend. He goes to the man’s house in the dark of the night and the two share tea before Get must perform his unpleasant task. Before his death, however, his friend made out a will that begged Get to raise his prepubescent daughter and then to marry her when she comes of age. This is Sun Toya, and she will soon bring Get plenty of trouble. Their relationship, which will mature into a marriage, oozes with pedophillic and incestuous undertones, which the movie plays up. The exoticism of the Chinese here is seen as the excuse, and while the movie does have its finer points in portraying its characters, the movie falls back fairly often on being both an expose– and an exploitation. After the murder, we jump to the then-present of 1932, where Tong wars are mostly forgotten as a new generation of Chinese-Americans. They’ve assimilated– Get has gone from assassin to businessman, while Sun Toya spends her days dressed in the latest fashions and dancing down at the club. The elder generation, mostly represented by the Tong president Nog Hong Fah (Dudley Digges), scoffs at this Americanization and clings to their traditions. When unrest in the form of a gang from Sacramento arrives the night of Get and Sun Toya’s wedding night, the Tong council is eager to start a new war and show the young Tongs what it really means to be Chinese. Get has adapted to the more peaceful American mindset and pushes back. However, it’s quickly found that the rival gang has been taken over by a cocky white gangster. His meeting with one of Get’s well thrown hatchets is a satisfying moment, but, unfortunately, Get returns home to find that the bodyguard assigned to him, Harry, has been spending his time making time with Sun Toya. Remembering the promise he made to her father, he lets the two lovers go. His Tong comrades shun him for not murdering his wife’s lover, and drive him into bankruptcy for letting the two run away. On one hand, the people Hatchet Man portrays come across as utterly human. They have their flaws, but they’re the same flaws that come from being an American– a problem with desire and generosity that always seems to push us into trouble. This view of Chinese-Americans who are successful and fun-loving is pretty rare for the time. To push this unusually charitable characterization further, the movie even goes so far as to stick a couple of knives in the bellies of its white audience. When Get’s business goes under, an auction to cover his debts sees many of his valuable and sacred possessions being sold to ignorant whites. The statue that Get prays to throughout the movie is sold to a man who takes the prayers out from their pedestal, rips them up, and drops them in the gutter. With that in mind, the movie is still pretty down on Chinese heritage itself. The film’s traditional Chinese people– with the casually cruel Nog Hong Fah and the owner of the opium den back in the motherland as their major representatives– are shown to be capriciously cruel. They’re zealots for honor and tradition. China itself is also shown to be crowded and unpleasant compared to San Francisco. But, still, it’s not this Americanization that ends up redeeming Get, but his ancestral heritage. His time in America, while demonstrating his good nature and loyalty, also showed the country’s tendency to chew people up and spit them out. The film’s final minutes celebrate Get for rescuing the daughter of the man he assassinated by demonstrating his skill with a hatchet. It’s not the clothes that made him, the money, or the power, but his ability to do the right thing– like kill a rotten brat– even when it goes against the grain of his adopted country’s beliefs and traditions. 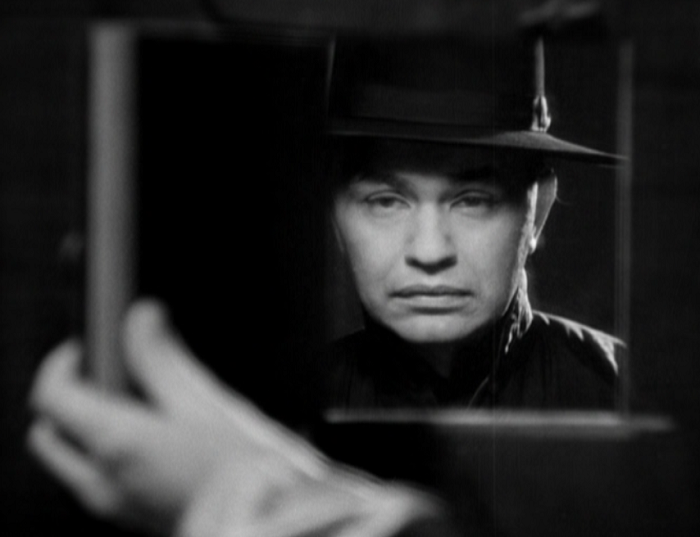 Edward G. Robinson’s a performer that’s hard to criticize. Short and stout and known mostly for his gangster roles (of which this one may be included as one of his more unusual outings), Robinson playful drawl, naturally narrow eyes, and commanding presence all fit into the movie’s idea of a hitman perfectly. Robinson is especially adept at displaying heartbreak– there’s something about that big clown-like mouth that creates an echo chamber for emotions. Get’s lowest points in the film work not because we buy that he really loved Sun Toya or that he is upset over their affair, but because we see the way Robinson’s mouth and eyes move, the shadow of a ruined man appearing before our eyes. Robinson also comes off the best in the makeup department, as his yellow face is barely present and fairly unnoticeable. Faring less well are Loretta Young and Leslie Fenton, who look, and I don’t think I’ll get a whole lot of disagreement on this one, absolutely atrocious. Young’s application in particular is egregious, looking like someone just slapped a bad rubber mask on her face and told her to go nuts. The film’s dialogue is also filtered through a painful series of cliches about the ways that Chinese-Americans speak, often with broken English dialogue and broken worded ‘ancient wisdom’ pouring forth the entire run time. Director William Wellman, one of the best directors of this and any other era, makes the film seem both airy and dramatic. His visual wit is also in full force, as in one scene that shows Get throwing a hatchet in shadow and then showing the head of a little girl’s doll falling off. 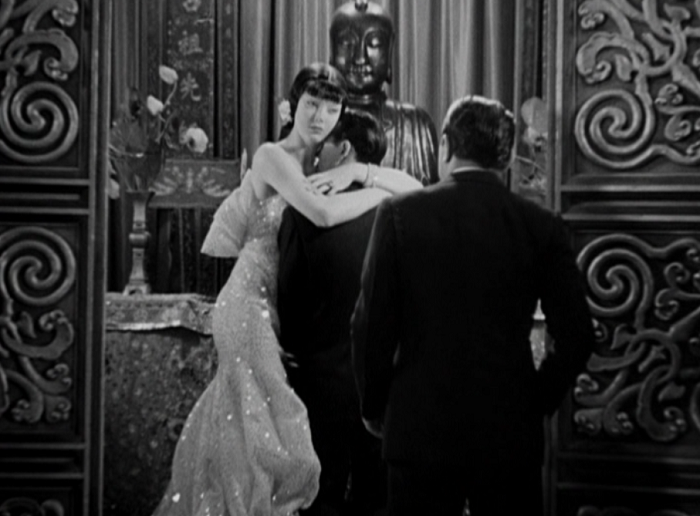 The film looks gorgeous, with Warner’s set decorators working overtime to give us Chinatown, China, and the social strata in between. The movie has some great compositions, and its final few moments are both surprising but also slightly anticlimactic– robbing us of a cathartic finale for an admittedly effective momentary shock. 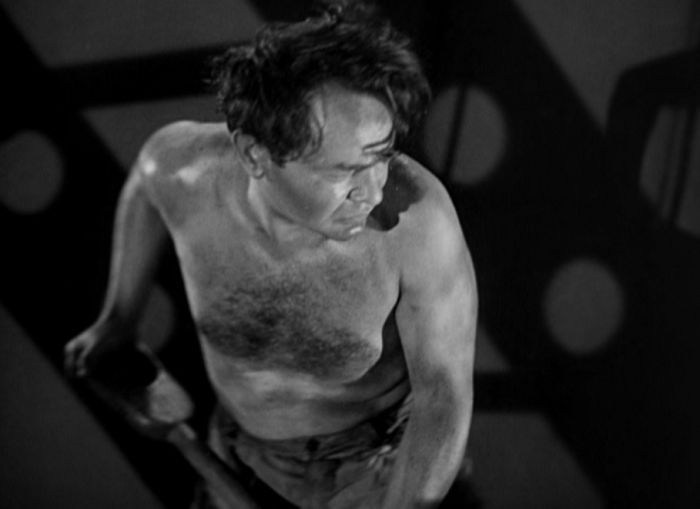 The film, thankfully, doesn’t rob us of shirtless Edward G. Robinson. In terms of the film’s racial politics, I’ve seen worse (it’s no Whoopee, I guess), but it’s still hard to shake-off the feeling the movie’s sensationalistic exotic tone, underscored by the morbid ending. Hatchet Man explains that Chinese people are people, people who the whites treat like crap and who are stuck in outmoded and cruel traditions that only seem to make their lives worse. The movie makes no excuses, but, like a lot of Warner Brothers movies of the time, takes the attitude that what we’re seeing is real life. It feels cruel to watch a bunch of white actors pretend to give us this gritty view of tribulations of a rather large group of people’s heart wrenching attempts to assimilate. Some days I can look past this if the story feels true– there certainly wasn’t the chance that this movie would be made with a full Chinese cast at a major studio in this time. But its choices to make the titular hatchet man a hero for his murders gives off an icky feeling. Though most of the film’s violence is filmed in shadows, it’s still shown as exciting and well deserved. I can’t help but feel its portrayal of the Chinese is along these lines, a disadvantaged and maligned group who are reduced to supporting roles in a trumped-up version of their experiences. While it’s a well made movie, it’s a purely vicarious thrill machine that just leaves something hollow and sad behind. 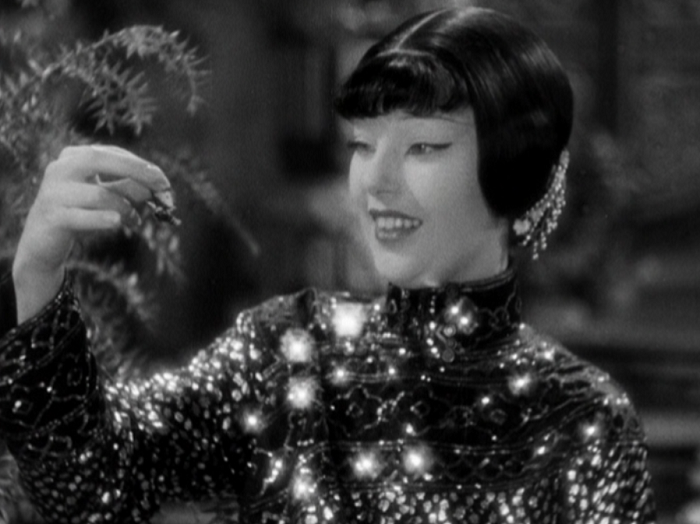 Japanese-born Toshia Mori was up for the Chinese-American role of Sun Toya San, before it went to Loretta Young. Mori later admitted it was the biggest disappointment during the first five years of her career before she was signed as a contract player by Columbia. Mordaunt Hall’s review actually talks about the movie’s premiere and Robinson’s appearance there. 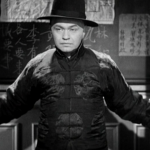 Edward G. Robinson, dressed in a starched shirt and dinner jacket last night sat in the balcony of the Winter Garden and watched his shadow, arrayed most of the time as a Chinese, perform in a grim melodrama of San Francisco’s Chinatown. After the picture came to an end, Achmed Abdullah, author of the story of “The Hatchet Man,” as the film is known, spoke in high praise of Mr. Robinson. Then Mr. Robinson came forth from behind the curtain and said pleasant things about Mr. Abdullah and his narrative. 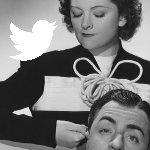 Before he retired he called upon Janet Gaynor, who was also seated in the balcony, to make herself seen by the many. The tiny titian-haired actress arose and kissed her hands to Mr. Robinson. All this pleased the throng who had just beheld a Chinese gangster die on the screen in a none too pleasant fashion, and the killer happened to be none other than the cheery little man on the stage in the dinner jacket. Pre-Code bitchin’ hat watch: bitchin’ hat found. 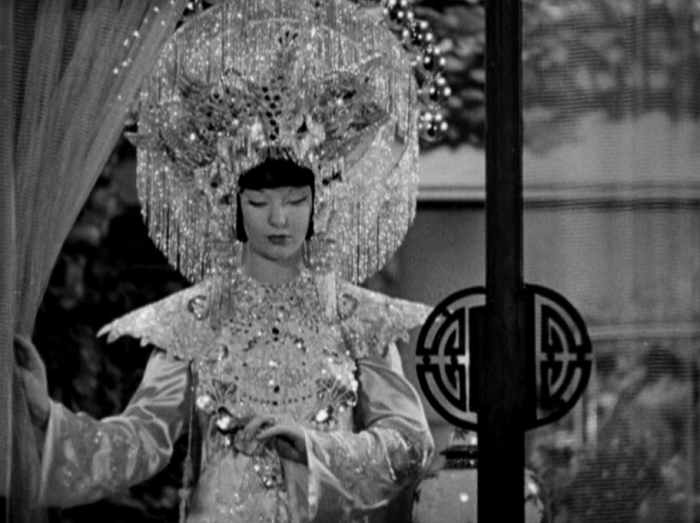 During the early twentieth century, Asian art and fashion became a fad. Chinatown grew into a popular (if disrespected) tourist attraction while Asian themes were in demand in popular entertainment by the 1920s. This trend, obviously, created some of the worst orientialism, with “no tickee, no washee” stereotypes of Chinese laundrymen appearing in Roscoe Arbuckle comic shorts of the teens. 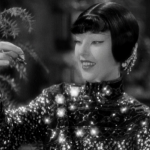 “Yellowface” makeup and performance became standard coding for American film studios to channel the East, and envision it through a Western lens by having whites in the roles. The style was so omnipotent that New York Times critic Mordaunt Hall found the makeup of the many cliched Asian roles in Hatchet, with passive postures and squinting eyes, to be convincing. (Loretta Young, as Toya, is unrecognizable.) For our purpose, it is worth noting that Robinson chose to avoid full yellowface, in lieu of subtle makeup and facial gestures, to suggest a sympathetic presence beyond his urban Americanism. 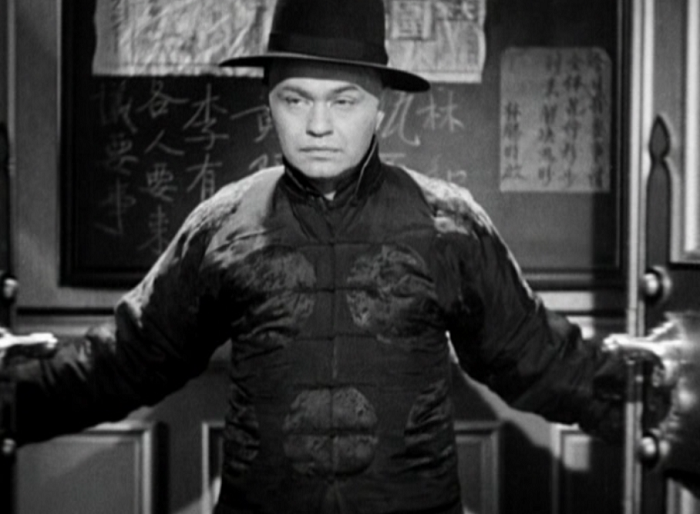 (Even Muni, in 1937′s The Good Earth, and Walter Huston and Katharine Hepburn, in 1944′s Dragon Seed, wouldn’t be so brave to abandon full yellowface.) 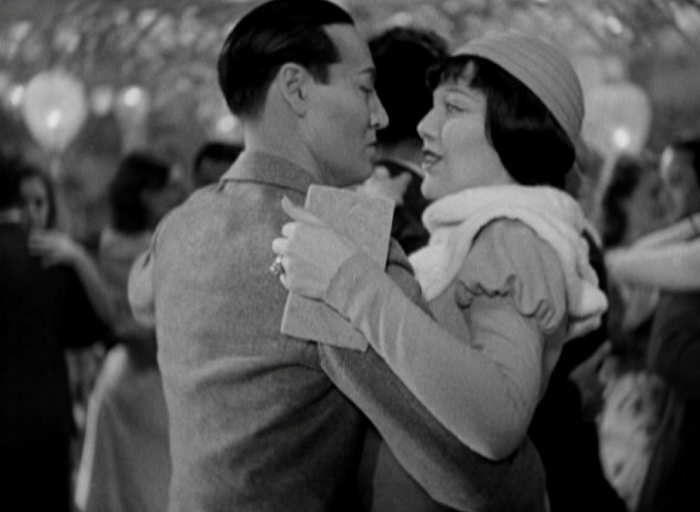 One might speculate that the decision resulted from Robinson’s new starpower post-Little Caesar, though a star no lesser than Lon Chaney played in full yellowface as late as 1927 in Mr. Wu (opposite Anna May Wong, to boot! 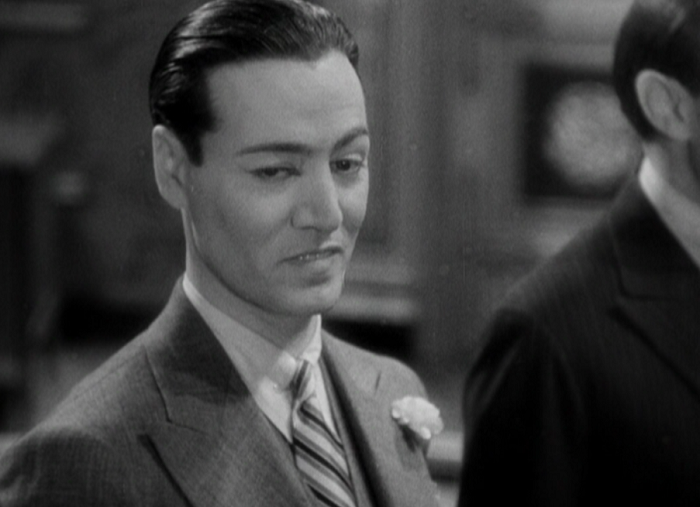 ), a style he cultivated in his pre-stardom roles Outside the Law (1920) and Shadows (1922). Robinson sticks to his own persona and thus embraces realism over caricature. Mondo 70 talks about the film’s racial components at length, including some great observations about how it’s probably more transgressive now than when it first came out. If The Hatchet Man is not quite as transgressive as, say, the Amos ‘n Andy vehicle Check and Double Check, it’s only because Wellman and his team aren’t consciously out to mock another race. In fact, they, like the playwrights whose work The Honorable Mr. Wong they adapted, probably thought they were honoring the humanity of the Chinese people, and by the standards of their own time they probably were. Even if we can’t take that pretense seriously, there’s an interesting mix of ethnic stereotypes and melodramatic conventions, as well as an attempt to transcend both in a matrix of self-conscious modernity before a violent finish. 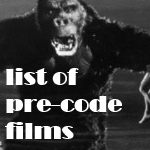 This film is available in the Forbidden Hollywood Volume 7 along with Skyscraper Souls, Employees Entrance, and Ex-Lady. You can pick it up on Amazon and Warner Archive. I really enjoyed your write-up, Danny. I taped this one off of TCM a while ago, but still haven’t gotten around to watching it. I’m going to make a point of it now. If you do, let me know what you think! 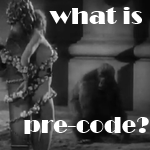 It’s hard to go too wrong with a pre-Code William Wellman film, that’s for sure. I love that the actor playing Harry En Hai played Samuel “Nails” Nathan in THE PUBLIC ENEMY the year before. Leslie Fenton, utility ethnic! I have to admit to liking this film, primarily because of the horrific/shocking ending. It took my breath away, but it seemed to the right ending – and one that could not have been done a few years later. The ending just felt to abrupt to me. I think if Robinson hadn’t been promising to come back tomorrow to take care of the punk, like he’d known he’d just taken care of the kid, I could have accepted it more. Or maybe if we’d gotten a glimpse of him coming back, realizing what he did, and just laughing. As it is, I just didn’t feel the payoff worked as well as it could have. 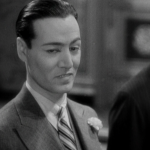 Previous PostPrevious Little Caesar (1931) Review, with Edward G. Robinson and Douglas Fairbanks Jr.